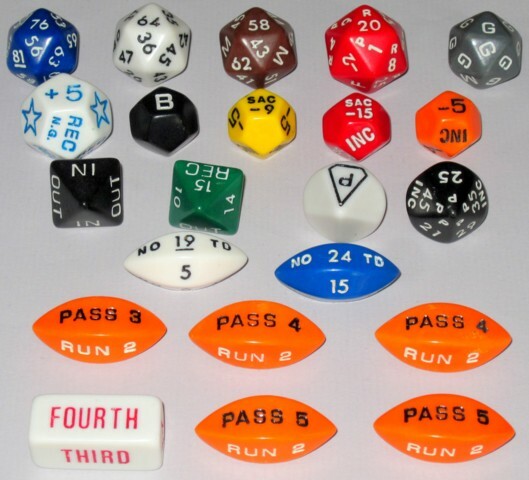 I am interested in numbered or pipped dice only, no symbols, and no stickers. Bottom row shows same dice, rotated by 180° along the horizontal axis parallel to the screen. 16 dice, but some are identical. 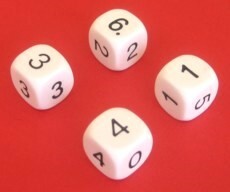 In many games, two or three dice are used and their sum is used as a random number. If the individual dice yield a uniform distribution, the density function of their sum is no longer uniform. The example of dice with M=2, M=4 and M=6 random numbers is considered below. There is an interesting set of three dice representing these three cases, the so-called Ubiquity Dice by Exile Game Studio. They are all octahedra, the white one being a binary die, the red and the blue one generating the sum of two or three binary dice, respectively. A fair quaternary die generates numbers 0, 1, 2, and 3 with probability 1/4 each. 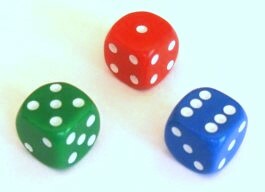 The sum of two such dice has seven possible outcomes: 0 (with probability 1/16), 1 (1/8), 2 (3/8), 3 (1/2), 4 (3/8), 5 (1/8), and 6 (1/8). The so-called Y2K die is a special die that generates exactly this type of random numbers. It consists of two halves, each with 0,1,2, or 3 dots. When the die is rolled, these halves can move (more or less) independently. There are spinners and rollers that generates the same probability distribution as the sum of two D6: 2 (with probability 1/36), 3 (1/18), 4 (1/12), 5 (1/9), 6 (5/36), 7 (1/6), 8 (5/36), 9 (1/9), 10 (1/12), 11 (1/18), and 12 (1/36). A fair “regular” cube generates numbers 1, 2, 3, 4, 5, and 6 with probability 1/6 each. The sum of two such dice has eleven possible outcomes: 2 (with probability 1/36), 3 (1/18), 4 (1/12), 5 (1/9), 6 (5/36), 7 (1/6), 8 (5/36), 9 (1/9), 10 (1/12), 11 (1/18), and 12 (1/36). Sicherman dice are the only other pair of 6-sided dice bearing only positive integers which have the same probability distribution as a pair of normal dice. These dice were discovered by Colonel George Sicherman, of Buffalo, New York and were originally reported by Martin Gardner in a 1978 article in Scientific American. The numbers can be arranged so that all pairs of numbers on opposing sides sum to equal numbers, 5 for the first and 9 for the second. If negative values are permitted, there are an infinite number of equal-odds dice. 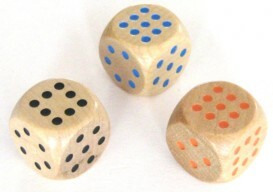 A set of nontransitive dice is a set of dice for which the relation "is more likely to roll a higher number" is not transitive. This situation is similar to that in the game Rock, Paper, Scissors, in which each element has an advantage over one choice and a disadvantage to the other. and green beats red with probability 21/36. 3,3,5,5,7,7; 2,2,4,4,9,9; and 1,1,6,6,8,8 (Efron set. Uses all the numbers from 1 to 9, and the face value of each die sums to 30). 1,1,1,13,13,13; 0,3,3,12,12,12; and 2,2,2,11,11,14 (the face value of each die sums to 42). 1,2,5,6,7,9; 1,3,4,5,8,9; 2,3,4,6,7,8 (this is the wooden pipped set shown above, blue/orange/black). 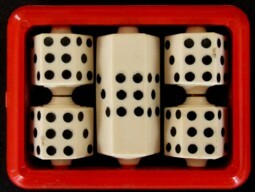 Minwin dice, invented in 1975 by Michael Winkelmann. No number appears twice on the same die, the face value of each die sums to 30, and the average is 5. 2,3,3,9,10,11; 0,1,7,8,8,8; 5,5,6,6,6,6; and 4,4,4,4,12,12 (Efron set). Cheater dice generate random numbers that differ from “fair” dice. 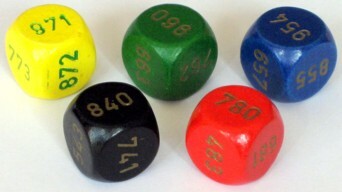 Some dice generate on average higher numbers than fair dice, others lower numbers. 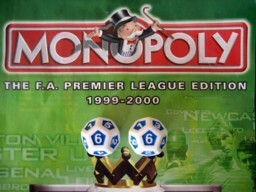 Other sets generate only a few (down to a single) random numbers and are used to tweak results in games such as craps. Craps is 2,3,7 or 12 on the first roll, & 7 thereafter. Loaded die, filled with liquid. Trick: A magician can add the numbers of the five dice within seconds – the result will be different each time the dice are rolled. Solution: The answer will be a four digit number. Sum the final digits of the dice to get the final two digits of the answer; subtract this from 50 to get the first two digits. The original set of 5 dice, invented by Royal V. Heath in 1927, was extended to 8 dice by Stephen Bradd of Clinton, IL. The rule is the same as above, but subtract the sum from 80 instead. 7 dice, numbers 1-35. All red numbers appear twice.